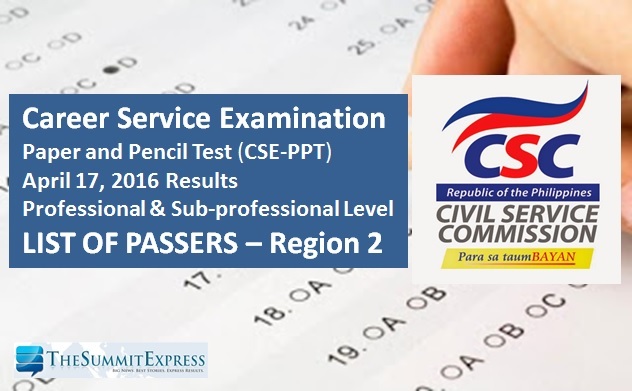 Those awaiting results for April 2016 Civil Service Exam - Paper and Pencil Test (CSE-PPT) known as the career service exam can find here the complete list of passers as the Civil Service Commission(CSC) officially released results on Thursday, May 26, 2016. CSC said that 1,074 of the examinees in Region 2 (Cagayan Valley) passed the professional level exam. Below is the full list of successful examinees for Region 2 (Batanes, Isabela, Nueva Vizcaya, Quirino) civil service exam (CSE-PPT) professional level and sub-professional level exam.